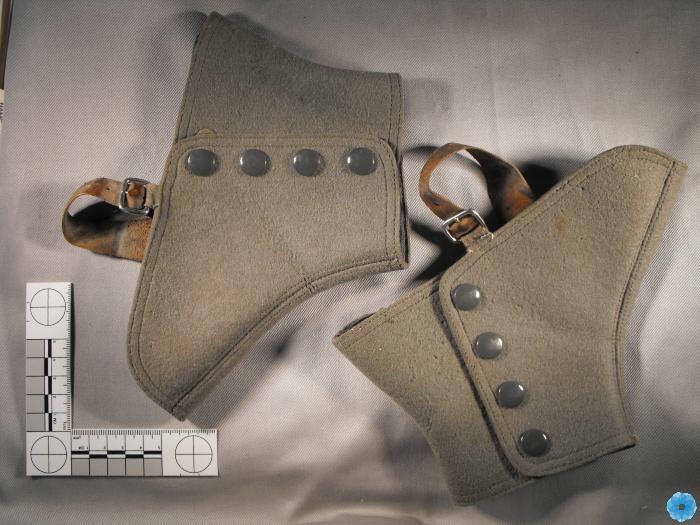 Narrative: This pair of spats were owned by Allison Morehouse of Freeport Nova Scotia. Description: Spats fit over the top of a pair of shoes. Each one in this pair consists of three pieces of gray material sewn together along the front and back to create the body. They are made in a triangular like shape with open tops and bottoms. The top circles around the ankles and the bottom openings rest over the top of the shoes. This part is fastened by a leather strap under each shoe in the arch of the foot. Along the outside the body the spats close with four snaps along the side. History of Use: Spats were used by most men when dressing up and were worn over shoes or low rubbers. They protected shoes and socks from mud spatters, etc.